A photo of the great front garden up the road from us clandestinely taken on the way home from work. It’s not your normal boring front garden as it’s laden with all sorts of fruit and veg if you look hard enough. There’s even some Bob Flowerdew endorsed upside-down wire refrigerator trays to stop the birds and some beer traps for the slugs. Big up non-conformist front gardening! 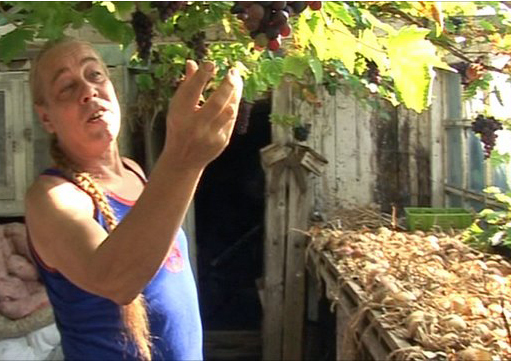 Bob Flowerdew (pictured in his King Tubby type vest) said a great thing on a recent Gardeners Question Time. The quote was along the lines of “Hoe when there are no weeds and there won’t be any weeds”. Bonkers, sound like what they’d say in Taiji but what he is saying is very true. Big up Bob (and his King Tubby’s vest)! 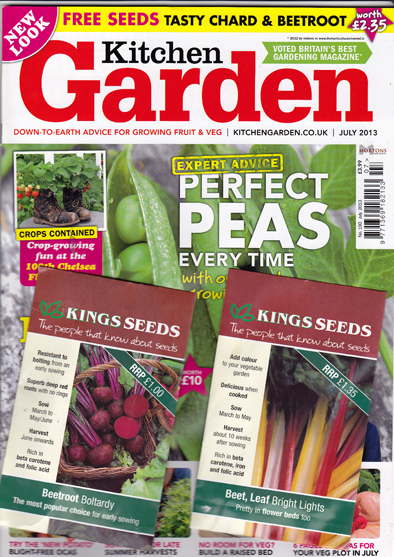 Free seeds with Kitchen Garden magazine! Popped into our local Co-Op on Friday evening and saw a gardening magazine with free seeds on the front so I had to get it, anything free me! The July 2013 issue of Kitchen Garden costs £3.99 but it’s got two packs of seeds on the front (Beetroot-Bolthardy and Beet, Leaf – Bright Lights) and there’s some good articles in it (Bob Flowerdew has a spread in it, tips on how to grow Basil, perfect Peas and growing Oca, the New Zealand yam) so, it’s a bargain! For the past week there’s been a tarpaulin covering the six feet high (and rising) mound of woody materials collected over the year at the bottom of our garden. It looked like there was an old car rusting away down there much to the disgust of the neighbours. Earlier in the week I treated myself to a dustbin incinerator (£32 at Wickes) and last night as part of the bonfire night celebrations burnt a whole heap of waste. That bin will be a boon as they say, what with all the un-compostable stuff that stacks up and if you use the funnel lid it can create some decent heat inside. 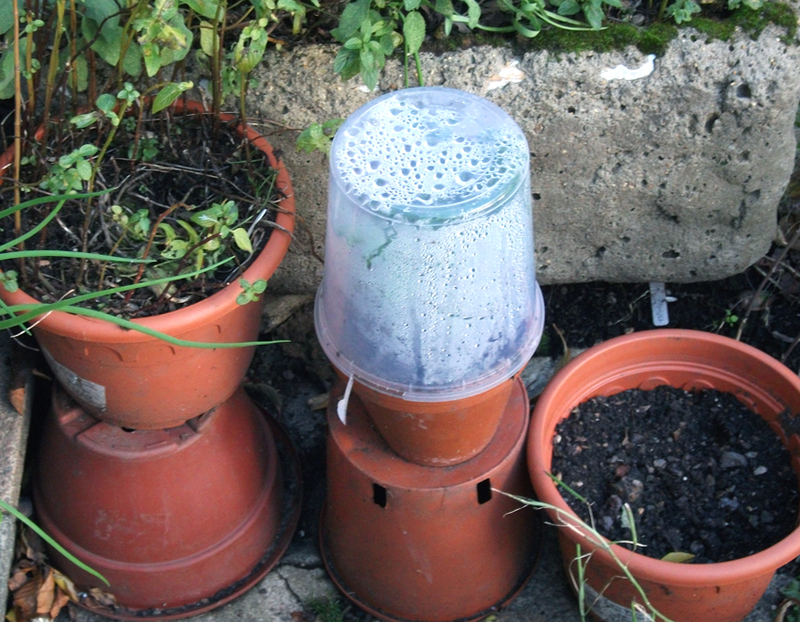 I also treated myself to a mushroom growing kit (£3.99 from Robert Dyas). It’s now festering under the stairs and there will be a ‘shroom update next week if everything goes to plan. Yesterday I did a little bit in the garden (little and often is my motto), preparing for winter including some weeding, cutting back and pulling out any old annuals, tomato plants etc and either stuck them on the compost heap or the pile for the bonfire. 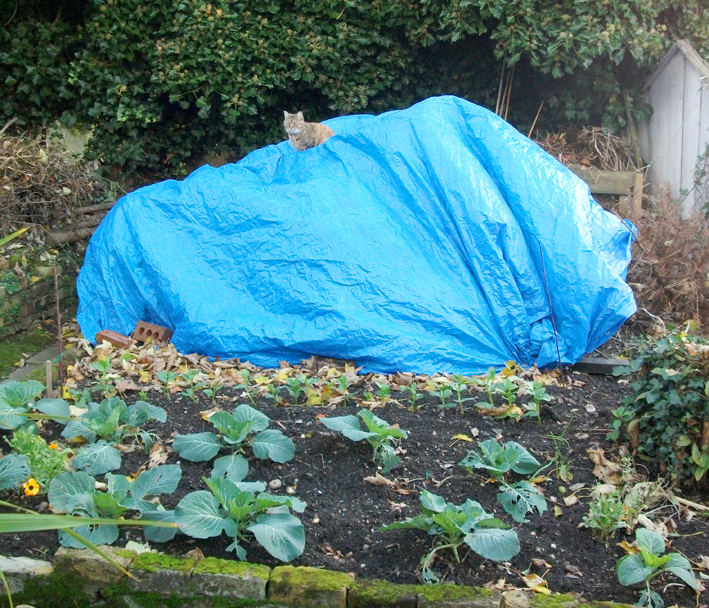 I also put a cover over the wormery (a council supplied hessian gardening bag) as it’s starting to get cold now and I might have to move it to the garage or near the house later on. Bubblewrap over the compost heap/wormery is also good to keep the heat in and I know Bob Flowerdew uses old carpet but the heap would have to be well out of view from the house as that method don’t look too attractive. 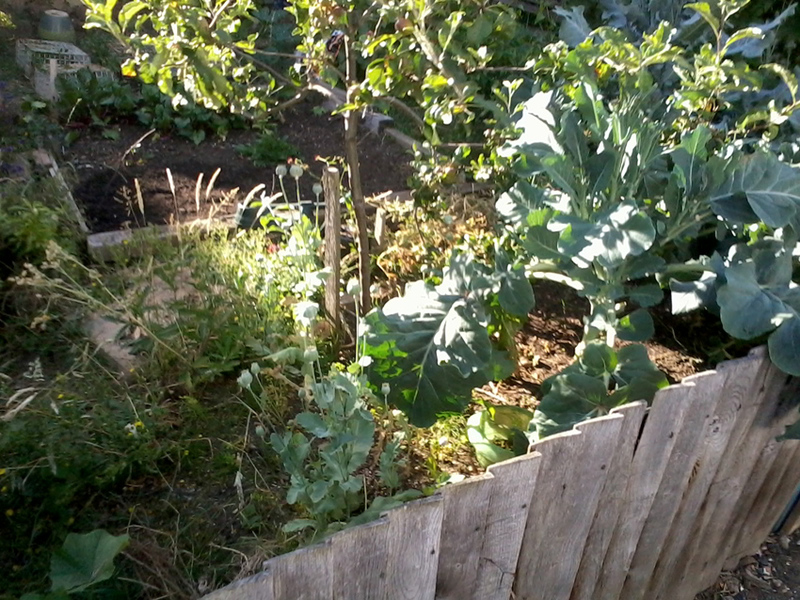 I’ll be netting the cabbages soon for protection against pigeons but at the moment the net’s being used to keep falling autumn leaves (and this weekend stray rockets and air bombs too) off the pond. 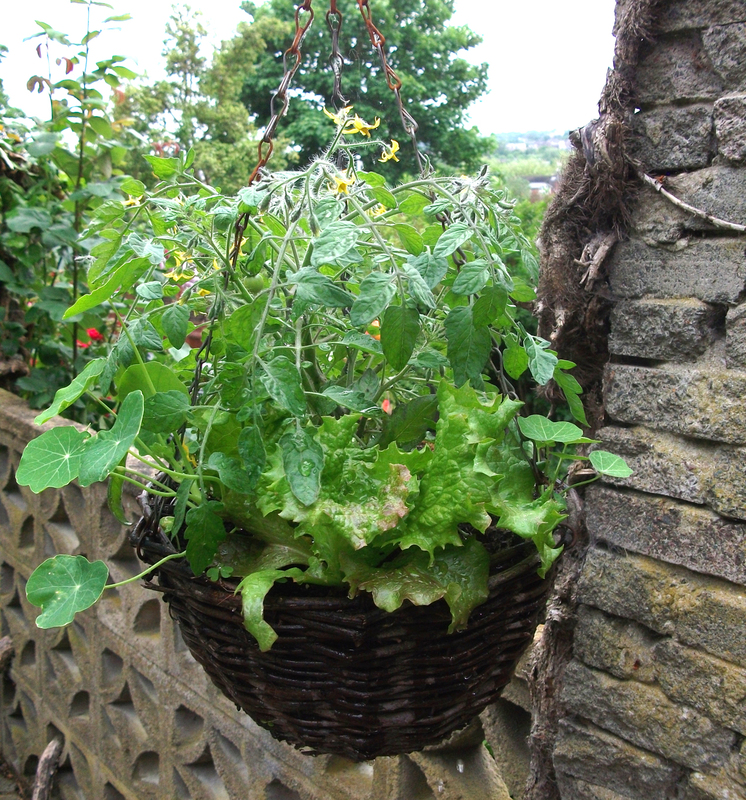 The lady down the road who has the mad veg plot in her front garden (spinach, cabbages, lettuces, a grape vine and more) uses old supermarket shopping baskets and what looks like wire trays from an old fridge to keep the pests off her plants. Bob Flowerdew would be proud of her! He’d be proud of me too, as I used last year’s plastic sweet tub from halloween upside down as winter protection for the parsley plant near the kitchen door. 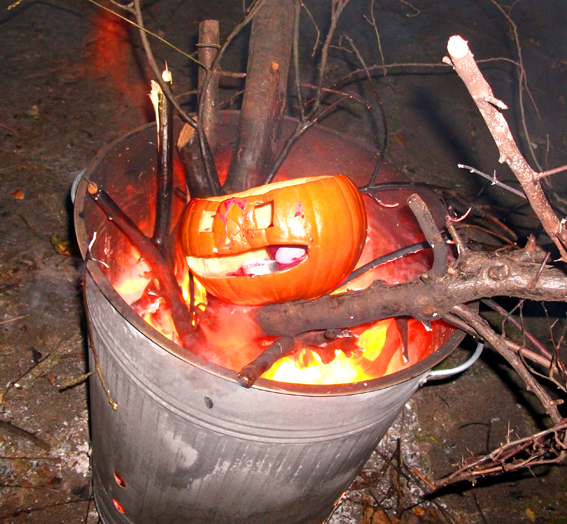 Ta to Amanda for wicker man pumpkin pic idea and Paul W for the inspiration to start this blog. It’s been well over a year now! 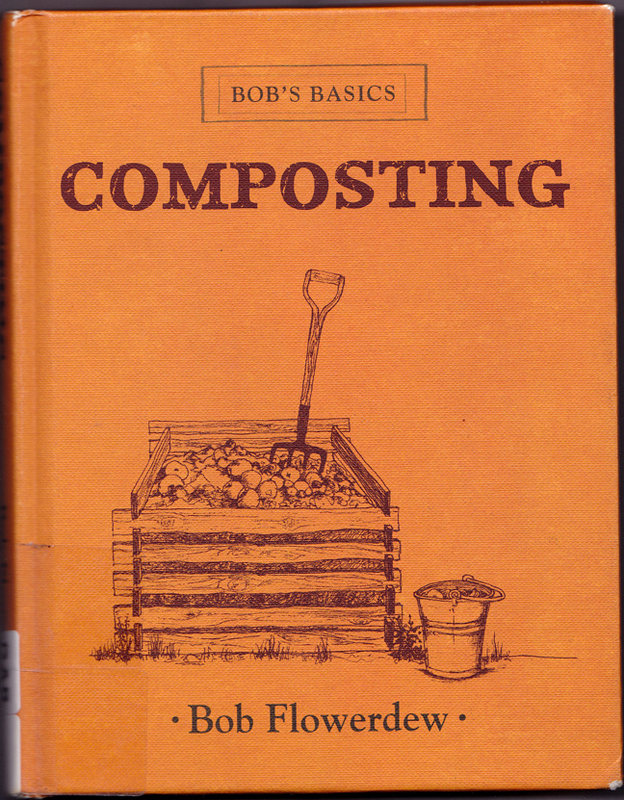 This a good little book about the art of composting from the great Bob Flowerdew, he of the Rob Da Bank ponytail and recycler of old fridges as mini-greenhouses fame. This was obtained from the local library but I reckon it’s well worth shelling out the nine pounds ninety nine for (probably cheaper as it’s a couple of years old now). It’s easy to read and stuffed full of hints and tips with humour making it a great reference book. The main themes running throughout the book are that even the worst heap can be corrected and once you start making compost and use it, you won’t be able to get enough of it! 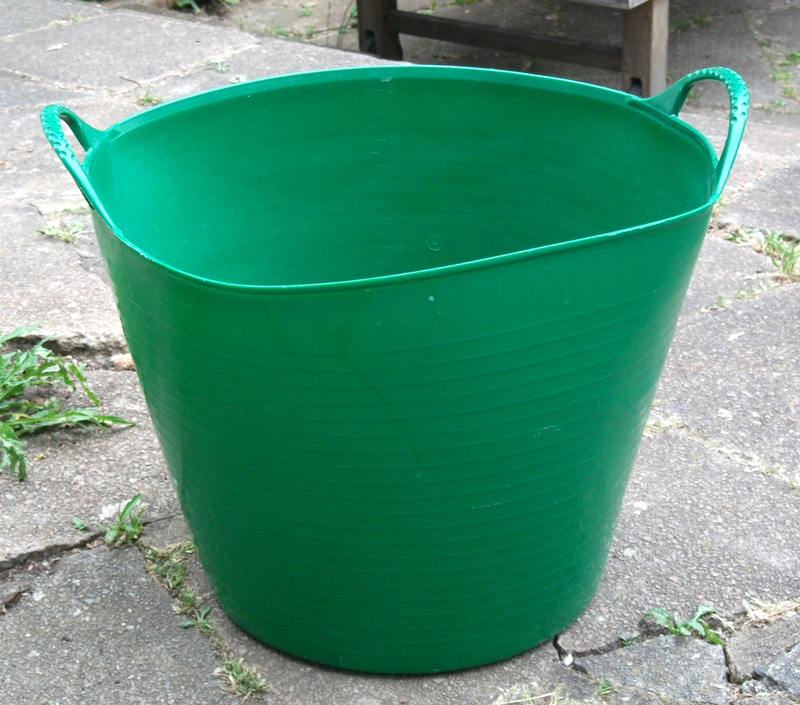 It covers the whole range of garden composting from the history of it, different designs of bin, what you can and can’t use, how to correct a bad heap and even covers wormeries, snaileries and chickens! There’s lots of things that I didn’t realise that you could do like using ditchwater to boost the heap and soaking weeds in dirty water for a few weeks to start them rotting down plus a great tip of always adding a thin layer of soil over the layer of new waste you put in to help it on it’s way. And finally, my favourite quote in the book is “sadly, composting human dung currently puts you in the ‘too eccentric to be a nice neighbour’ camp”. And I thought adding urine from a bottle was considered a bit bonkers!